Taglines: Real adventure has no limits. How I love to watch history-telling like this! What talent in both writing and film making it is! This is both epic and important. 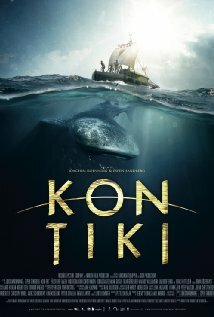 This is the story about the amazing world famous Kon-Tiki trip crossing the pacific on a balsa-raft just to prove this happened in ancient times, made by the makers of great Max Manus. The trip, taken on the basis of an idea of the explorer Thor Heyerdahl, was completely ludicrous and no one believed it could be done. and how could a trip like this be told better than by Heyerdahl himself in the documentary made during the trip. Back in 1947 this was just the story the world wanted to be told after the 2nd world war and the atomic bombings of Hiroshima and Nagasaki. The documentary film from the trip later won Oscar (1951), and the book was translated into 70 languages, and sold more than 50 million copies world wide. It's a great story and a great film which will make new generations pick up the book with the same name, before they watch the original documentary. Beautifully filmed, well played, even down to Heyerdahl incredibly bad English pronunciation. Not all is accurate. There's been a debate around the premiere about making Herman Watzinger such a wimpy character, when we actually was a Norwegain 100 m record holder and a strong guy with good looks, but the writers found the story needed heart, and not only bald and crazy feeling-less young men. I agree. Over 100 days on a raft is at least 90 days of boredom. Thor Heyerdahl himself made this trip to prove his idea, which no one would believe, and later got famous. He made the trip though he was not only not able to swim, but actually afraid of water, can you imagine! And it also tells the story of those left behind, wife and kids. This is the most expensive Norwegian film production ever, and the story is a Norwegian sacred explorers story, as good as they come, changing world history. Thankfully the film floats as good as the raft, and is well wort ha watch. Great manuscript, beautifully filmed, good handcraft. The film comes in both a Norwegian and an international (English) spoken version, which gives the movie a possibility to be shown all over the world. And it will. Treat yourself to an insane, but epic trip, and get to be an explorer yourself. This is great storytelling! It loses one of 10 stars due to the irritating (though factual) English pronunciation of Heryerdahl. Not necessary to re-experience that to make a good story.